Redesigned in 2014 with a new seal system and complete Enduro bearings. External English BB for 68mm shells. Compatible with 24/22mm (SRAM, Truvativ, Etc.) cranks. Fully serviceable. 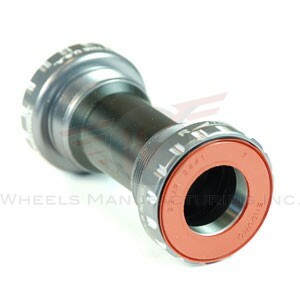 Note that the Angular Contact bottom bracket contains the ABEC 5 angular contact sealed bearing in the drive side cup only. The non-drive side cup contains an ABEC 3 sealed bearing. Smooth, free, nice sealing. Long-term durability unknown. Mine had one slip up: one of the supplied seals was the wrong size which was a bit frustrating but Zinn Cycles saw me right.